59 year old internet cooking sensation, who went viral after making an entrée meal out of Ramen noodles, passed away after suffering a heart attack over the weekend. We were first told by Fee’s nephew Sosten Price and sister Ayesha that the 59-year-old died Tuesday after the medical emergency. However, we’ve now learned she’s on life support surrounded by family at Harbor-UCLA Medical Center after being rushed by ambulance. Fellow internet star James Wright Chanel, famous for his hilarious review of Patti LaBelle’s pies, stated Fee was still alive and fighting for her life. 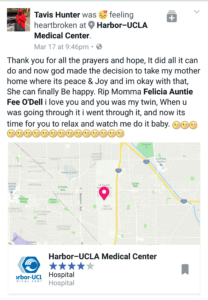 Fee’s son addressed her fans in a Facebook live video. 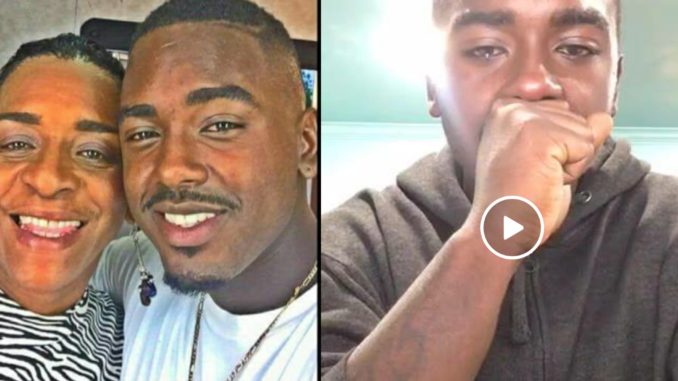 He first played a Rick Ross song as a tribute to Fee, then told fans how he can’t find the strenght to pick up a camera again since his mom passed. Travis,I had to send you a message. Today i just discovered your mom’s cooking videos . Once i watched one….the stuffin video i was hooked. I watch 4 more videos. Sady i came across her memorial video and my happy laughing mood changed to disbelief. I wanted to subscribe but was sadden to find out i was too late. I want to thank your mom and you as well formaking me laugh and giving me recipes that i will try. 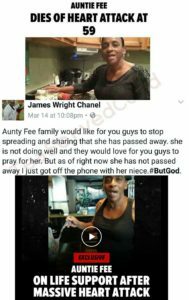 RIP AUNTIE FEE! Ur Mom was a true Blessing from God! I’m so sorry for Travis lost, may she rip. However what I don’t understand is how could her own family prematurely sold her story to the press? Why sell the story at all? Money can make you do some crazy things! Auntie Fee you are truly Missed I’ve learned so much from your cooking videos you know i had to put my own mfu…twist to it like you say ..lol..make it your own. ..missing you. .